Graphic design training and expensive graphic design software are no longer needed to create colorful, compelling imagery to share with your neighbors. Read on for SE Uplift staff picks from the world of free (yes, free!) imagery and design tools. With this treasure trove of image resources, you will soon be posting images with everything you put out in the world. 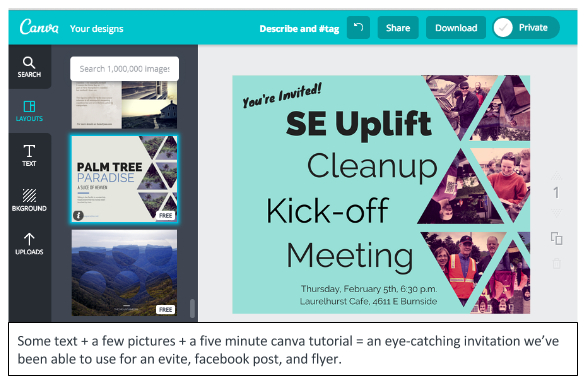 Probably our most-used image tool at SE Uplift, Canva makes image creation easy (super easy!) even for non-designers. Their pre-made graphic templates allow users to create stunning visuals for web or print including blog graphics, facebook posts, flyers, posters, invitations and more. Canva also offers free design tutorials to help even the most graphically challenged folks create catchy, colorful images. Just look at these before and after images created using Canva templates. Picmonkey is another great tool for editing images. Use it to retouch photos like a pro (lighten, brighten, remove red-eye, whiten teeth, you name it), or add instagram like filters, text, and graphics. But our favorite thing about Picmonkey is you don’t need to create an account to use it. Powerpoint might not be the first thing that comes to mind for image creation, yet we here at SE Uplift swear by it. Powerpoint is great for cropping images, layering visuals, adding text, etc. Another great feature in powerpoint is the ability to remove the background of a image. When you’re design is done, just choose to save the slide as an image. But whatever you do, please don’t use any of the stock clipart. Pixabay offers a wide range of public domain photos, drawings and vectors that can be used for free without attribution. Pixabay allows users to search by keyword, color, orientation, and image type. 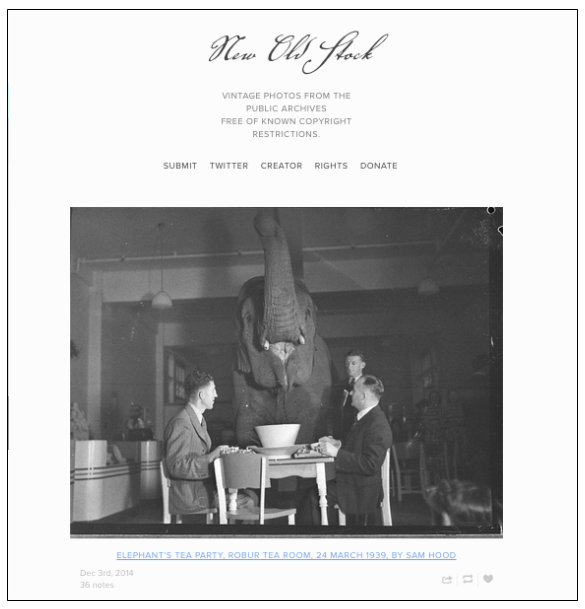 New Old Stock offers up imagery with a vintage flavor. Consider it a curated list of images with no known copyright restrictions from the public archives. What the site has in charm, in lacks in searchability. So be prepared to spend a little time scrolling. If you are working on a project and want some kind of chunky, slender or impactful typeface, visit the following sites. We’ve highlighted a lot of ways pictures can activate your designs, but just utilizing fonts can also be really impactful. Just check out these examples of text only flyers, making use of size, color and contrasting fonts to make eye-catching designs. Font Squirrel offers a vast selection of free fonts for download. Font Squirrel allows browsers to filter fonts through a number of options, including categories like retro, calligraphic, bold, and more. They also offer free and easy to use tutorials for how to download, install and begin using the fonts! Lost Type is the first of its kind, a pay-what-you-want type foundry. The site has a collection of over 50 amazing fonts that can be used for personal work (work where you are not paid for your services, and where there is no monetary benefit to any party as a result of using the font) . Some of the fonts veer towards a little too trendy but they also have some solid, versatile fonts that pair functionality with personality, like Governor. Now go forth and create compelling graphics!